Age: circa 1888, Serial No. 2871, Platen size 10" x 15"
Colt's Armory has a long history of being the first private firearm manufacturer to make guns with interchangeable parts successfully. The Armory was the brainchild of Samuel Colt and began production at Hartford Connecticut in 1855. Hartford is still home to Colt. To maintain accuracy and precision Colt built many specialized custom machine tools. This turned out to be just the place for Merritt Gally, a New York preacher, who came up with a revolutionary design for the Platen press. In 1869 Gally patented his designs and called on Colt to build them. 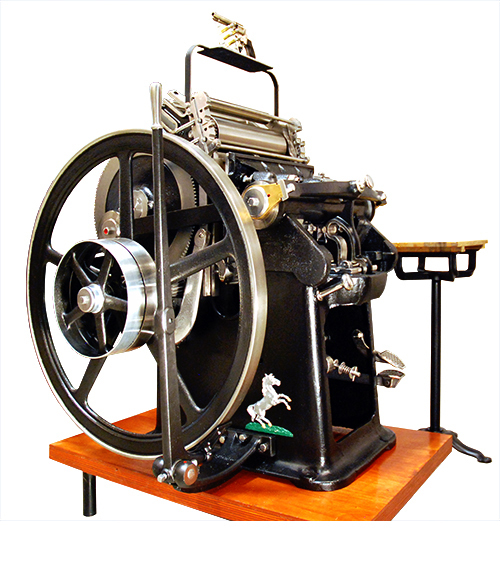 From 1873 till 1902 Universal presses (also known as parallel impression) were built by Colt and referred to as the Colt's Armory Press. What better place to build precision machinery! An understudy of Gally was a man named John Thomson. 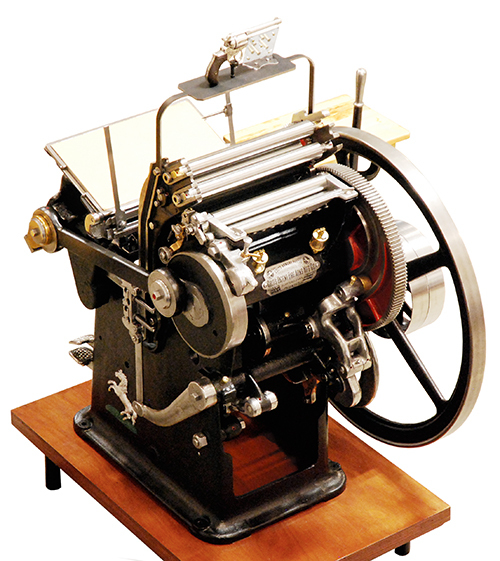 Thomson improved on the Universal and after a bitter legal battle with Gally, also had his "Improved Universal" made by Colt until 1902, when Thomson started building them himself. 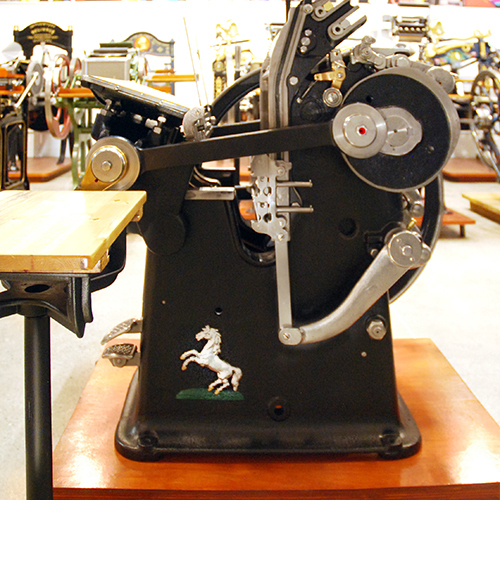 The Colt's Armory press was so ideal that even today this same design is manufactured and used primarily for Diecutting. Our press was manufactured ca. 1888 at Colt's Patent Firearms Manufacturing Company. The pistol was made a year earlier - in 1887. It's highly probable that tools used to make the printing press were also used to make the gun. 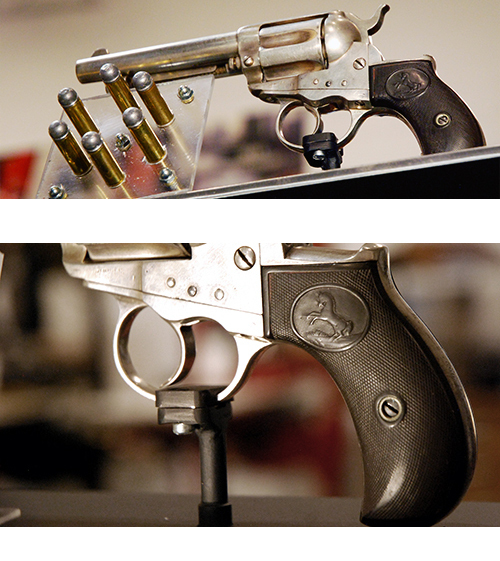 The pistol is a Colt's Thunderer and also referred to as a Long Colt. It is a .41 caliber single or double action with chambers for six bullets. 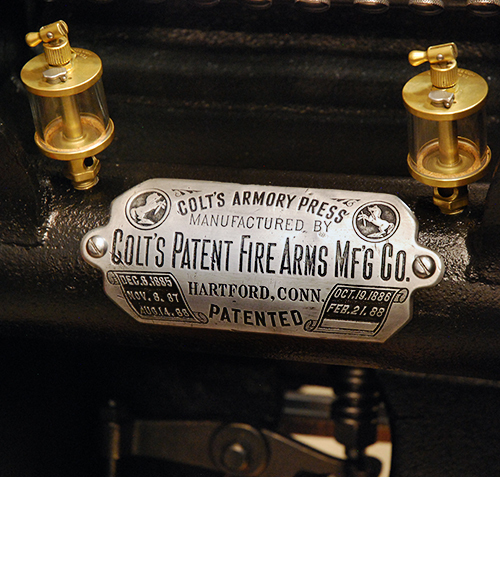 The gun bears the stamp: "Colt's PT FA MFG Co Hartford CT USA" on the top of the barrel. Its serial number is 58522. Patent dates beginning in 1877 are also stamped on the nickel plated trigger guard. 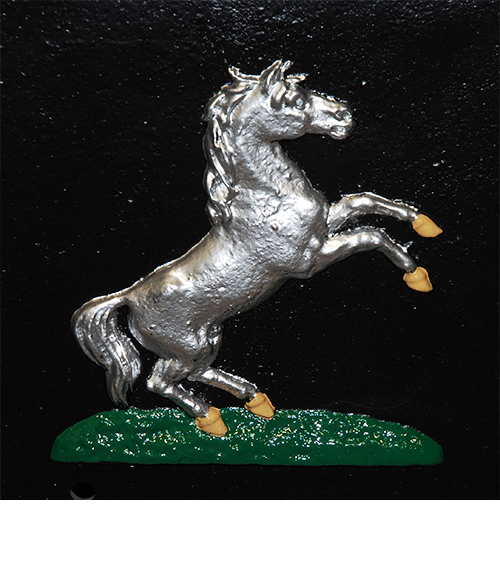 The famous rampant pony is emblazoned on the grips - same as the bas-relief rampant on the press.